Applying for a Kenyan Passport has never been this easier since you can now do it online without having to move out of your house or workplace. 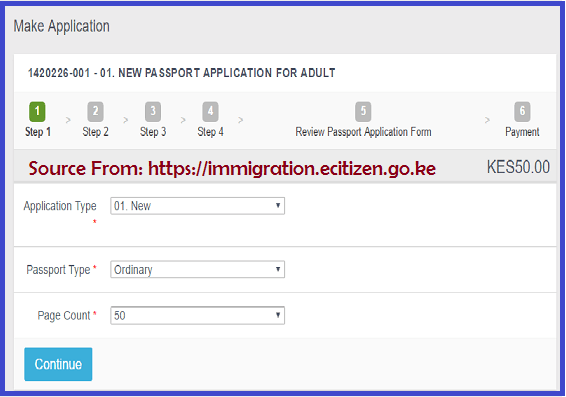 The Kenyan Government through the Ministry of Immigration introduced a new set of rules that requires any person who wishes to apply, replace or renew a Kenya passport to do it online by visiting the eCitizen portal. Through the eCitizen portal, it is now easier to save on time and costs that would otherwise be incurred when visiting immigration offices to apply for a new Kenyan passport. Initially, people would have to avail themselves physically to the Immigration offices in order to apply for a Kenyan passport. With technological advancements and the continuous use of internet websites, visiting an Immigration office is a thing of the past unless you want to submit application forms which have already been filled. Thanks to the eCitizen portal, you can now avoid long queues while at the same time get all services that you need without moving an inch. An original and copy of your National Identification Card. An old passport if you want to replace it. An Original and photocopy of your parents’ identification documents. Three passport size photos which have been taken recently. An eCitizen pre-filled passport application form and three copies of the invoice. Once you have all these requirements in place, you can proceed to apply for the Kenyan passport online application for both fresh / renewal on eCitizen portal. To make this process simple and quick, you must have an internet connection that is fast together with a device which can be used for accessing the internet. The step by step explanation below will help you in applying for a Kenya passport online application by accessing the e-Citizen portal. On your browser whether Mozilla Firefox, Google Chrome or Internet Explorer, type in http://www.ecitizen.go.ke/ as the official link for accessing eCitizen portal. Once in the website, you will be required to register yourself with the portal in order to get access to services which are being offered. For you to register on the portal, you must have a National ID number and a registered mobile phone number. Once you have registered on the portal, you can log into the site by using the credentials which were generated as you opened your account. These log in details will have been sent to your email account or your registered mobile phone number in the form of a short message. After logging into the e-Citizen portal, navigate through the website until you find the Immigration Department Services from where you will click on “Passport Application Form”. In the new page that appears, you will be required to select one form from the three different forms that are displayed i.e. Adults Passport form, Children Passport form and Temporary Permit Passport form. Once you select a form that best suits your interests, you will automatically be redirected to a different page on the site. This new page contains all the charges and application guidelines that a person must follow. Click on “Apply Now” button which is at the bottom of this page to display the online application form. When the online application form has been displayed, correctly fill in all the details required. After you have filled in all details, you will be required to counter check whether the details provided are correct. If there is no mistake, click on ‘Continue’ button to proceed with the application process. You will then be redirected to a payments page. In this page, select the mode of payment that you would wish to use i.e. Debit Card, Credit Card, M-pesa, eCitizen agent, Airtel money or Prepaid Debit Card. After making the payments, click on ‘Complete’ to finalize the application process. Once the payment has been successfully received, you will be able to access the next page on the website. This usually takes close to 5 minutes if you have a fast internet connection. You can now download the application form together with three receipts after which you can print them. Finally, you will be required to physically submit the forms to any immigration offices located in Kisumu, Mombasa or Nairobi (Nyayo House). After submitting the forms to an Immigration office, it will take close to 10 working days before you can finally get your first passport. For any other application that you may have done on the eCitizen portal, it will take about 5 working days before you can get them. In cases where you have not correctly filled in all the details or personal information, you will have to wait longer before you can finally lay your hands on the passport. You may be required to visit an Immigration office in order to make the necessary changes. It is also possible to check the progress of your application status by simply visiting the eCitizen portal. From the portal, you will be able to know whether or not the application has been approved. Before you can complete the application process, you will be required to pay a given fee. Costs incurred depend on the type of passport that you want to apply. Below are the charges which you will have to pay when applying for a Kenya passport. When making payments using Debit card, Credit card or prepaid card, you will be charged an additional 2.5% as a handling fee.